On 25th March 2014, His Holiness Patriarch Kirill of Moscow and All Russia met with Dr. Riad Haddad, Ambassador Extraordinary and Plenipotentiary of the Syrian Arab Republic to the Russian Federation. They were joined at the meeting, which took place at the Patriarchal working residence in Chisty side-street, by archimandrite Philaret (Bulekov), vice-chairman of the Moscow Patriarchate’s Department for External Church Relations (DECR), archpriest Sergy Zvonarev, DECR secretary for far abroad countries, and Mr. Nofal Kaltum and Mr. Yusef Arbash from the Syrian Embassy. 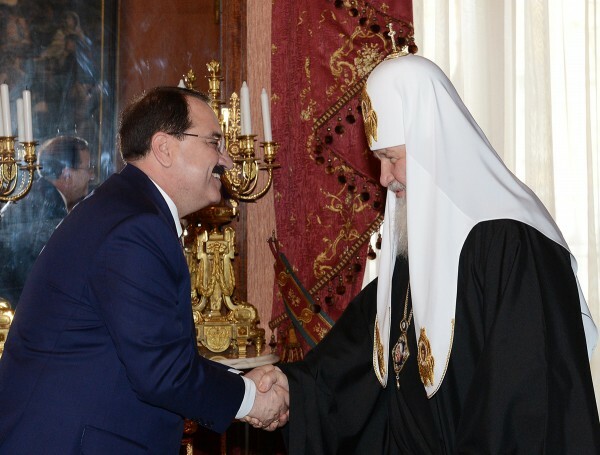 The Primate of the Russian Orthodox Church greeted Ambassador Haddad and stated that the Russian Orthodox Church was concerned about the situation in the Middle East and especially in Syria where armed conflicts have continued for three years. His Holiness continued to say that though Christians are a minority in Syria and in the Middle East, Syria is the land where the first Christian communities have come into being and the followers of Christ began to call themselves Christians, and where the most meaningful monument of Christian history are located. ‘The lack or decrease of the number of Christians means a change in the important cultural and historical balance. Wherever we can, we speak about the necessity of immediate cessation of all military action in Syria. We say that it is possible and necessary to solve the Syrian problem by peaceful means. Unfortunately, the two Geneva rounds had not achieved result, but there is no other way except negotiations.’ His Holiness mentioned the abduction of the two hierarchs and the release of the Maalula nuns and asked the Ambassador to convey his gratitude to the President of Syria for his efforts undertaken for the release. His Holiness added that terrorism was a great threat to all people and again called for peaceful settlement in Syria, which experiences economic difficulties. The Russian Orthodox Church and the Imperial Orthodox Palestine Society has sent several humanitarian shipments to Syria and raised money for the Orthodox Church of Antioch. ‘I would like to express our support to the Syrian people and our hope for the cessation of bloodshed. We hope that Syria, this beautiful country with a rich history and culture, with its high level of inter-ethnic and inter-religious relations, will return to peace and people will live a prosperous life. Ambassador Haddad thanked His Holiness for the meeting and for an opportunity to tell him about the situation in the country. He underscored that the Syrian people oppose international terrorism. Christianity in Syria is not a fortuitous phenomenon, but a major component of society. Christians comprise some ten percent of the population, meaning over one million people. They freely worship in churches which one can find throughout the country. Christians live in some 2,500 villages and towns. They are patriots of the country, the Ambassador emphasized. He said that during the armed conflict 98 Christian churches were either partly destroyed or completely ruined. There were destroyed 1,900 mosques, 1,600 schools, and 60% of hospitals were partly or completely destroyed and medical equipment as plundered. His Holiness Patriarch Kirill said that these figures show the humanitarian catastrophe in Syria and expressed his confidence that despite all this will not break Syrian people’s spirit.